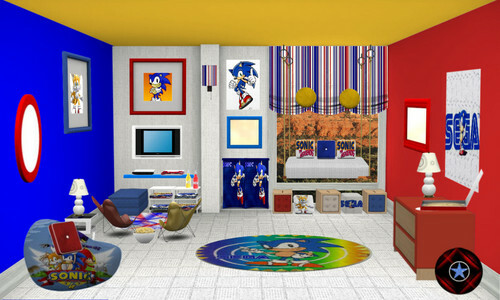 Sonic bedroom. Made in Dreamhouse Designer on FB. HD Wallpaper and background images in the Sonic Fan Characters club. This Sonic Fan Characters fan art contains living room, living room, sitting room, front room, parlor, parlour, drawing room, and den. There might also be bedroom, sleeping room, sleeping accommodation, chamber, bedchamber, and kitchen.